Mozarts comic operas are among the masterworks of Western civilization, and yet the musical environment in which Mozart and his librettist Lorenzo da Ponte wrote these now-popular operas has received little critical attention. 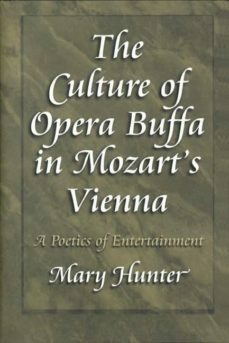 In this richly detailed book, Mary Hunter offers a sweeping, synthetic view of opera buffa in the lively theatrical world of late-eighteenth-century Vienna. Opera buffa (Italian-language comic opera) persistently entertained audiences at a time when Joseph was striving for a German national theater. Hunter attributes opera buffas success to its ability to provide "sheer" pleasure and hence explores how the genre functioned as entertainment. She argues that opera buffa, like mainstream film today, projects a social world both recognizable and distinct from reality. It raises important issues while containing them in the "merely entertaining" frame of the occasion, as well as presenting them as a series of easily identifiable dramatic and musical conventions.Exploring nearly eighty comic operas, Hunter shows how the arias and ensembles convey a multifaceted picture of the repertorys social values and habits. In a concluding chapter, she discusses Cos" fan tutte as a work profoundly concerned with the conventions of its repertory and with the larger idea of convention itself and reveals the ways Mozart and da Ponte pointedly converse with their immediate contemporaries.